Entrepreneurs are faced with numerous decisions when forming a business. First, they need to contemplate the nature of the corporate entity they wish to operate (i.e., corporation, limited liability company, partnership, etc.). This decision hinges on many factors including the type of business, the desired ownership structure, tax considerations and potential financing opportunities. If the entrepreneur determines that forming a corporation is most advantageous for his or her particular situation, then he or she must next decide whether the corporation will be taxed as an S-corporation or a C-corporation. The “S” and “C” designations refer to different subchapters of the federal tax code. They each have their own governing requirements and qualifications, some of which are laid out below. An S-corporation must meet several requirements before the state will accept an S-corporation election. Among other things, the entity must have only “allowable” shareholders (i.e., only individuals, certain trusts and estates), must have no more than 100 shareholders, and must have only one class of stock. Once the state approves of an S-corporation election, that entity will become a “pass-through” entity, similar to a limited liability company and partnership. Therefore, while the S-corporation is subject to a 1.5% tax on its net income in the State of California, the remaining tax liability is passed on to each shareholder. Each shareholder is then responsible for paying taxes on their pro rata share of income from the corporation and for taking into account any applicable deductions and credits accrued on behalf of the corporation. The benefits to shareholders of an S-corporation include the fact that corporate income is taxed only once (as compared to double taxation with a C-corporation). Also, the individual shareholders are not personally responsible for the losses of the S-corporation. Consequently, creditors may only look to the corporation to satisfy its debts. By default, a corporate entity will be taxed as a C-corporation unless it elects to be taxed as an S-corporation. This means that the C-corporation will be subject to double taxation, once at the company level and then again on the shareholder level, when dividends are paid out to the shareholders. Therefore, as opposed to an S-corporation, money that is earned in the C-corporation will be retained within the company rather than passing through to the individual shareholders. This has its own benefit, including the fact that losses can be carried back for up to three years. Some other benefits of C-corporations include that C-corporations can hold initial public offerings and easily reissue stock or buy back stock. 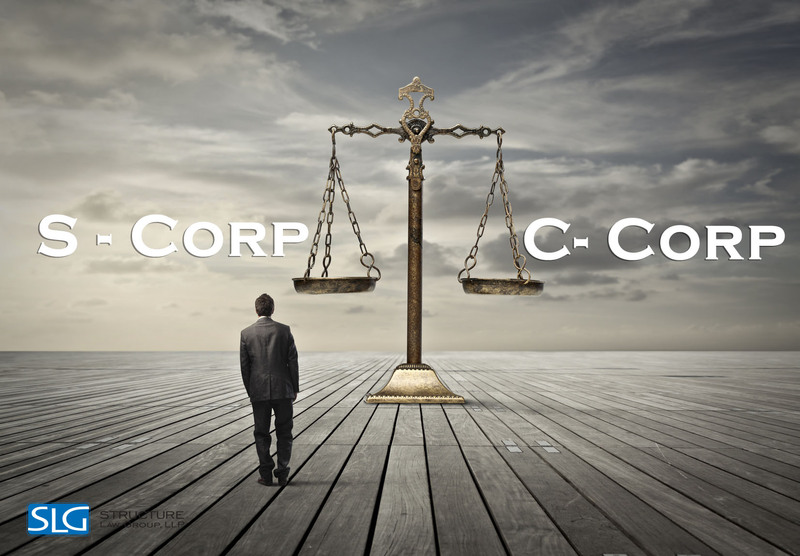 Further, there are no limits on the number or type of shareholders in a C-corporation. In addition, just like with S-corporation, creditors only have recourse against the corporation itself for any debts owed, and the individual shareholders are not responsible for losses. Entrepreneurs should carefully consider the benefits and drawbacks of both the S-corporation and C-corporation election when deciding what type of entity to form. It is generally best to make this decision in close consultation with an experienced corporate lawyer who can guide the entrepreneur through the implications and benefits of the election. The skilled corporate attorneys at Structure Law Group, LLP work closely with entrepreneurs to create the most advantageous tax designation for the new corporation while preserving corporate indemnity. Call Structure Law Group, LLP today at 408-441-7500 and get your corporation on the path to profitability.